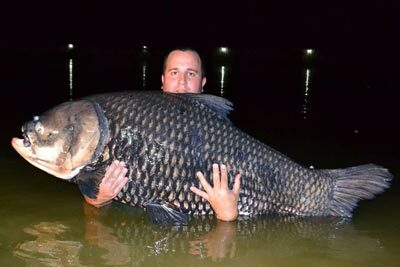 Thailand Fishing Holidays - Catch a Monster! 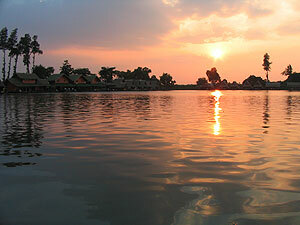 We arrange wonderful fishing holidays and guided fishing tours in varied and magnificent surroundings with experienced Thai fishing guides, ranging from daily tours at one of the many lakes and ponds near Bangkok to bespoke weekly angling holidays for some of the world’s largest freshwater fish at a variety of stunning destinations throughout Thailand. 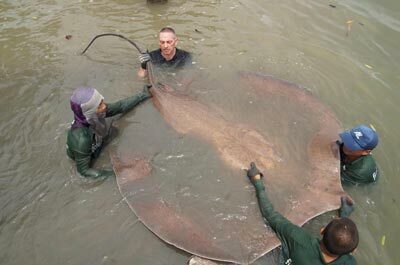 Why not follow in the footsteps of River Monsters Jeremy Wade and National Geographic fishing for Giant freshwater stingrays on one of Thailand’s wild tidal river systems – the Bank Pakong River or the Maeklong River? Perhaps you would prefer to explore one of Thailand’s vast wild dams in search of the elusive Giant Snakehead? Whatever your dream Fishing holiday – you can be assured that Fishsiam provides the most experienced and professional fishing guides to ensure you have the very best fishing experience. Fishsiam has been at the forefront of freshwater angling in Asia since the inception of our company in 2008, providing bespoke guided tours and trips with experienced local guides for hundreds of satisfied customers, please see our catch reports page. Our tours are suitable for anglers of all skill levels ranging from novice to the most experienced and can be tailor-made to the clients exact angling requirements. If you want the best, friendliest guides and the best baits, tackle and equipment come fishing with Fishsiam, the originals! Taking the Fishing Holiday of a Lifetime in Thailand has Never been more Affordable! Our wonderful stocked and wild fishing destinations have more monster fish species in them than any other country in the world. Fishsiam specialises in bespoke guided freshwater angling tours and vacations and we invite you to contact us so we can create the ultimate freshwater angling experience for you. Please select the holiday that you are interested in from the categories shown below. NB: In addition to the listed daily and weekly options shown, we can also arrange longer expeditions if you are in search of that fish of a lifetime. Thailand predator fishing holidays with Fishsiam allow the visiting angler the chance to fish for a vast selection of predator species both native and introduced to Thailand. Anglers fishing in Thailand can fish for a diverse range of predator species ranging from native Thai species such as chaophraya Catfish and Goonch Catfish to Amazon giant fish such as Arapaima, Redtail Catfish and various other monster fishes. 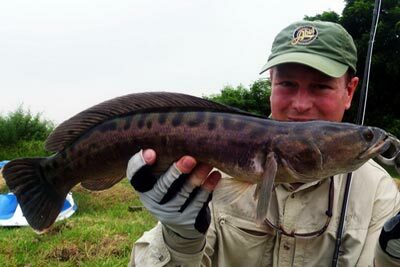 Snakehead fishing holidays in Thailand guided by Fishsiam. 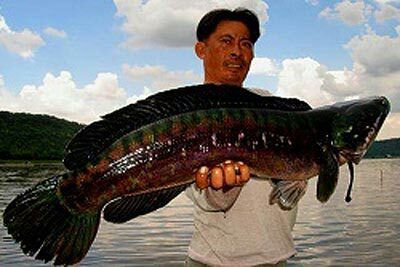 This allows anglers to fish for Giant Snakehead at a variety of wild and exotic destinations such as the vast Khao Laem Dam reservoir in Kanchanaburi or the scenic River Ping in Chiang Mai. Our Guided snakehead fishing expeditions regularly see us fishing deep in the jungle against a back drop of rich flora and fauna and tropical wildlife. Our Guided bespoke Fly fishing holidays in Thailand offer visiting fly fishermen the chance to fish for a variety of exciting predatory species ranging from Giant Snakehead , Chaophraya Catfish and Barramundi to more exotic Amazon fish such as Arapaima and Sorubim. Whether choosing a daily fishing trip or weekly holiday Fishsiam can provide guided fishing at a range of different venues in Thailand. 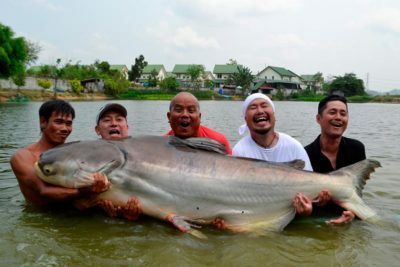 Our Carp fishing and Mekong Catfish holidays in Thailand offer anglers various exciting options to fish for the largest carp and catfish species in the world. We offer daily and weekly guided fishing tours at a variety of commercial fisheries and wild fishing destinations throughout the fantastic fishing destination, Thailand. This is high quality fishing with the best guides. Our multi venue fishing holidays in Thailand allow anglers the opportunity to tailor make their own fishing holiday to their own precise angling requirements. Anglers can choose to combine fishing for Giant freshwater stingrays, Giant Siamese Carp, Mekong catfish,Giant Snakehead and a whole host of other monster fish into their own guided bespoke fishing holiday. If you are interested in finding out more about our guided fishing and holiday packages – please do not hesitate to contact us using the button below.